When it comes to placemaking, perhaps no other place in the U.S. is better-versed than Detroit. A turn to placemaking has transformed public spaces across the state of Michigan, with PPS supporting the process at every turn. Detroit in particular is an iconic example of how reimagining public spaces can change the face of a city — and this legacy of placemaking is still in motion. This place-led approach continues today through the Southeast Michigan Placemaking Pilot Initiative grant, supported by the William Davidson Foundation. The grant is targeted at short-term improvements to shared spaces across metropolitan Detroit, and provides $25,000 to four grantees, as well as technical assistance from PPS. The grant program supports local organizations in engaging residents to activate public spaces, while working towards their broader institutional goals. One such grantee is the University of Michigan Hillel, an Ann Arbor-based Jewish cultural center for university students, which applied for the grant in efforts of cultivating an inclusive sense of community. The center’s weekly Shabbat dinners already convene up to 550 students, and the Hillel building is a popular study spot. Nonetheless, the backyard space behind the Michigan Hillel center laid dormant most of the year. When PPS met with staff and students, and engaged them in the Place Evaluation Game, plans for new seating, hammocks, bean bags, better signage, and winter-friendly amenities like heaters and fire pits came into focus. Surveys to students also made it clear that more events oriented around food and the holidays would be an attraction to the space, in addition to yard games and outdoor study space. With these lighter, quicker, cheaper (LQC) improvements, Michigan Hillel is on track to solidify its status as an inclusive campus gathering spot at all times of the year. “We enjoyed our visit and discussion with the folks from PPS this week. It was so refreshing to talk to professionals who think with big vision and detail about how to use our outdoor spaces to build community,” says Tilly Shames, executive director, University of Michigan Hillel. Pewabic Pottery, located in its original National Historic Landmark building on Detroit’s East Jefferson Corridor, was looking to make a mark of its own on the community. Already world-renowned for its tile and ceramic work, some of which graces edifices like the Basilica of the National Shrine of the Immaculate Conception in Washington, D.C., Pewabic Pottery staff hoped to become locally renowned as a gathering space for students and visitors. In the main building, instructors give ceramics classes for all levels and ages and provide special programming for under-served youth and hospitalized children. Despite this daily activity, Pewabic Pottery’s gravel courtyard was under-utilized housing three kilns, but not much activity. 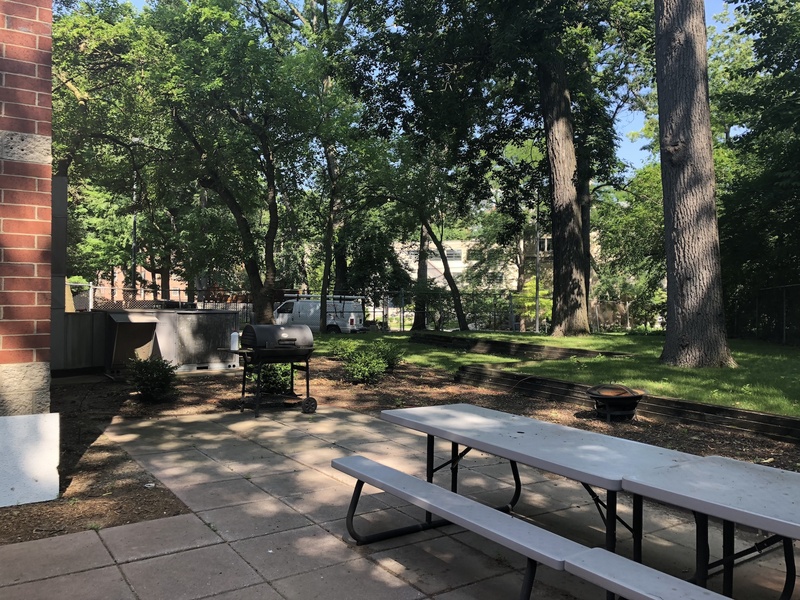 After visioning with PPS, Pewabic’s staff, board members, and students, expressed interest in softening the fence in the courtyard, adding greenery, and creating a more comfortable area to gather with the addition of resurfacing the courtyard floor and a new pergola. An exciting new mural has added color to the space, and staff members have also expressed excitement about building an outdoor pizza oven, and a tiled fountain featuring Pewabic work in the center space — firing up pottery and lunch all in the same space! Detroit’s Motown Museum, housed in adjacent houses owned by Berry Gordy and his family, otherwise known as Hitsville U.S.A., is a local landmark with a yearly attendance of more than 90,000. Yet its gathering space, which is situated between the two buildings, remains inactive, despite being walkable and accessible by bike and bus. Museum staff and broader stakeholders were interested in reviving the space all while connecting diverse groups of residents and visitors through arts and educational outreach, and fostering multi-generational connections. By providing a space in which seniors can be mobile and independent, and share their personal histories of the Motown era, while also functioning as a creative hub, the Museum hoped to enhance its role as a part of the living history of the City. Initial plans to improve signage and create better surfaces for dancing are already in motion, bringing the space to life and bringing outside the history and sounds of Motown. At Repair the World, young Jewish adults become community organizers, working on local issues like education and food justice and providing outreach across Detroit. The natural next step to this outreach is to create a gathering space, open for educational events for students and neighbors, as well as a community garden. During a visit from PPS, members of Repair the World landed on new ideas to turn the workshop’s outdoor space, including the historic gazebo, into a welcoming, active area for the neighborhood. By cleaning up the perimeter of the yard, physically opening up the space to its neighbors, and adding new seating and programming with nearby partner Matrix Theatre, the yard itself will soon come to match the community-based mission of the organization. Since the placemaking workshop with PPS, Repair the World has continued with the outreach process, connecting at neighborhood council meetings and checking in with neighboring organizations. The Southeast Michigan Placemaking Pilot Initiative grant has put metropolitan Detroit on track for even more placemaking success — harnessing the energy of iconic local institutions to create gathering places in places like Detroit and Ann Arbor. Thanks to the support of the William Davidson Foundation, Michigan is continuing its long-standing record as a world leader in great public spaces.